The Polish Jewish refugee artist Josef Herman’s connections with south Wales are relatively well known. He came to the then mining village of Ystradgynlais in 1944 for a fortnight and, captivated by its miners and the wider community, remained for eleven years. In 1962, he was awarded the Fine Art “Golden Medal” at Llanelli National Eisteddfod. Herman was born in Warsaw in 1911 and within a couple of years of his death in the year 2000 the Josef Herman Art Foundation Cymru was set up in the Welfare, Ystradgynlais. Two years ago, the Foundation, a registered charity, entered into a partnership with the Tate Gallery in London. It is called ‘Mining Josef Herman’ and one of the initiatives is to ‘excavate’ his contemporaries. 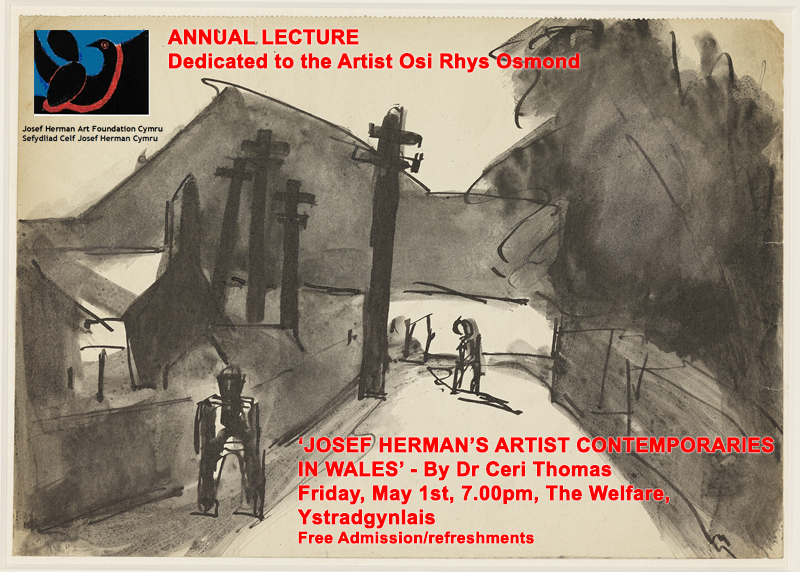 At 7pm on Friday 1st May, Ceri Thomas will give an illustrated talk in the Welfare, Ystradgynlais, on some of Herman’s artist contemporaries in Wales. These include the English-born Mary Fogg (1918-2012) and the Welsh-born Will Roberts (1907-2000). Herman was best man at Fogg’s wedding in Neath in 1945 and Roberts, who was also based in that town, first encountered the Polish artist in Ystradgynlais in the same year. This generation of artists, including Herman himself, became part of what has been called a ‘Welsh environmentalism’ in painting that had began with other artists before the war and which flourished in the immediate post-war period. Ceri Thomas is a curator, art historian and artist who specialises in the visual culture of modern and contemporary south Wales. He was a trustee of the Josef Herman Art Foundation Cymru from 2010 to 2015.